Is Criticism Killing Your Marriage? Criticism is destructive to relationships and that is why we have called it a “Marriage Killer”. Criticism is finding something wrong with the other person. Every spouse will do or not do something that their spouse judges as un-approving. You can choose to communicate your desire for a different behavior from your spouse in a way that brings you closer together, or you can choose to communicate your desire for a different behavior from your spouse in a way that tears them down. 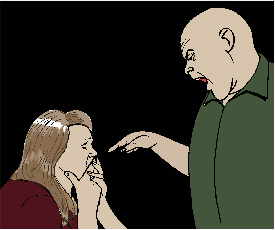 Criticism goes beyond communicating what request you have of your spouse’s behavior change. It goes into language about your spouse’s character, identity, family, etc. Criticism is putting down your spouse and finding fault in them. This is often associated with assuming the worst about their intentions. Complaints focus on the behavior that you are requesting to be changed. Criticism focuses on the worst possible attributes of the person whose behavior you are requesting be changed. Complaints focus on resolution with a request. Criticism focuses on making the other person feel bad for what they have done or failed to do. Criticism usually begins very hard. It usually begins with the word, “You”. Criticism exaggerates. “You never”, “You always” and “This is the thousandth time…”. Criticism frequently includes a higher level of energy and may include a raised volume of voice and demonstrative body motion. The reason criticism is a Marriage Killer is because it frequently leads to limited or no communication about the issue. The issue becomes reoccurring and remains unresolved. A pattern of negative interactions set in and communication comes to a halt. Before long, hurt feelings and lack of engagement lead to the couple living lonely parallel lives. The end is near. What Can I Do About Criticism? If you are on the receiving end of criticism, it is easiest in the moment to withdraw, become defensive or reciprocate the criticism. None of those responses move toward resolution. They may feel good in the moment, but they move us away from our goal of life together forever in a happy home. Usually, if we listen close enough and not react we can hear in the criticism something that sounds like a reasonable request. By focusing on the reasonable request within the criticism instead of focusing on how it was said, we can move toward resolution by turning the conversation toward it. Let me share an example. Let’s say one spouse angrily says, “You are so mean. You knew I was going to have to drive my car to work this morning. You didn’t even have the courtesy to put gas in it when you drove it home last night. You are such a jerk.” You can choose to focus on the name calling and the way it was stated, or you can hear the reasonable request within the criticism. You might say, “Oh my goodness, I am sorry for not noticing the gas gauge when I drove your car home last night. I will do my best to pay attention to the gas gauge in the future when I drive your car. I did not intentionally leave you with your car out of gas. I’m sorry.” By focusing on the reasonable request, we can usually disarm our critic and solve the issue at hand. If you are usually the critic, you have the most power to change your employment of this Marriage Killer. There are a couple of things you can do that we have found helpful for critical spouses. Most critics do not realize just how critical they are. Some do not know that they are being critical at all. The first thing you can do is keep track of how often you are being critical. Your critical nature and view of your spouse (and perhaps your life) is probably getting in the way of the things you really strive toward. If you can get a better handle on your criticism, you can reach more of your goals and have a happier life. Notice your thought before you say anything. If you can catch your thought before you say anything you have a great chance to change the outcome. Having really high analytical skills can be very helpful for certain jobs, but in a relationship, it can lead to constant criticism. Try honing your analytical skills toward the positive things your spouse is doing. Communicate what they are doing that is working so well or for which you are thankful. Tell your spouse what you like and/or love about them and what they do. Catch them doing it right and tell them what you saw about how well they did whatever it is that you liked. Most importantly, if you notice your thought and you have not said anything, put it into the “Complaint Formula” and speak it to your spouse in a way that focuses on resolution. Take several minutes to try out the complaint formula on something you want your spouse to change. By focusing on the behavior that you want changed, you are more likely to be heard. By specifically asking for the change you desire, you are focusing on resolving the issue. Your spouse is more likely to want to change the behavior, even if it takes reminding them several times through this same process. This article is written by Roy and Devra Wooten, authors of “The Secret to a Lifetime Love”. Learn more at www.LifeTogetherForever.com © Roy and Devra Wooten 2014. All Rights Reserved. You may replicate this article as long as it is provided free to recipients and includes appropriate attribution. Written permission for other use may be obtained at Secret@LifeTogetherForever.com.